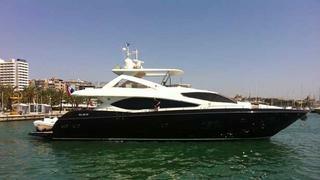 Debbie Beere at Dbeere Yachts sends news that she's signed the 26.8m motor yacht Bandazul for sale. A Sunseeker 88 delivered in 2010, she offers extremely high specifications throughout including Trac Star digital fin stabilisers. Accommodation is for eight guests in a full beam master suite, VIP cabin and two twin cabins. Lying in Spain, Bandazul is asking £3.3 million.